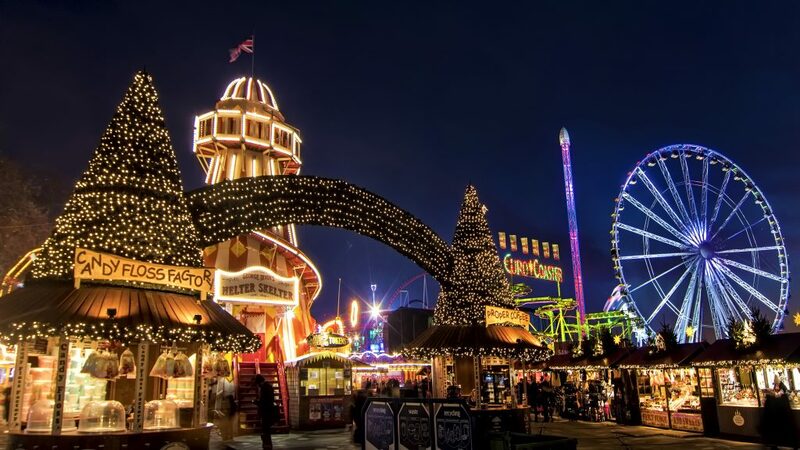 I go to Hyde Park Winter Wonderland every year as there’s nowhere more ‘in your face’ about Christmas. It’s bright, brash and loud but it sure is Christmassy. Open from 22 November 2018 to 6 January 2019, this year looks even better for kids. There’s Peter Pan On Ice, Backyard Cinema’s The Snowman Experience, Zippos Christmas Circus and more starting from as little as £5 with family deals from £20. And for the first time, there’s a brand new dedicated family entrance that brings you in right near the MegaDome (nearest tube station: Marble Arch). 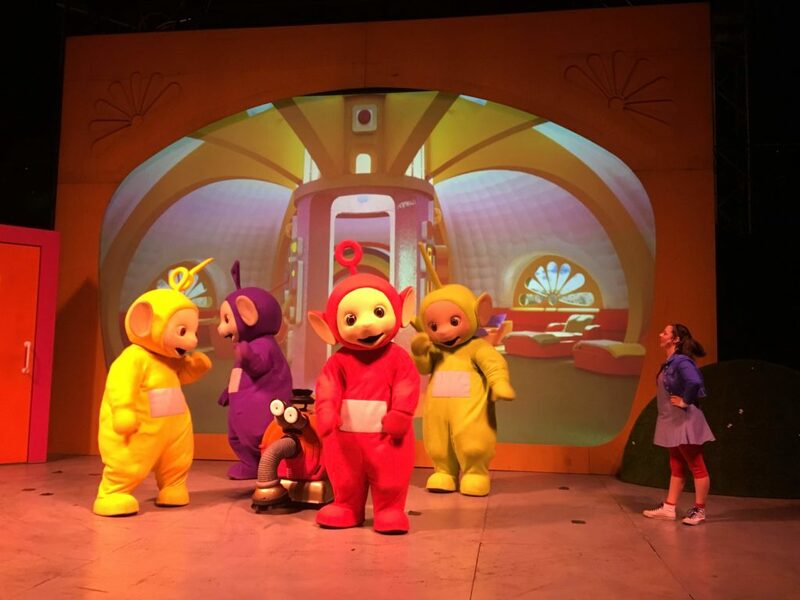 Every day at 11am, the little ones can join Tinky Winky, Dipsy, Laa-Laa and Po in the MegaDome for the Teletubbies Christmas Show. It’s a 45-minute interactive show in a huge circus tent (the biggest in the UK). There’s a free buggy park and the MegaDome is heated too. I saw this with a preschooler who had a lot of fun. Initially, she was a little afraid of the characters but once the show started she shouted, clapped and danced along with everyone else. All the audience loved the special festive guest too. To celebrate the 40th anniversary of Raymond Briggs’ beloved picture book, The Snowman, Hyde Park Winter Wonderland has teamed up with themed cinema experts, Backyard Cinema, to bring a world exclusive, immersive adventure: The Snowman Experience. One of the UK’s best-loved family films will be brought to life as guests explore the multi-roomed, multi-sensory, cinematic adventure guaranteed to delight the entire family with Christmas cheer and childlike wonder. This isn’t watching a film at the cinema as you start in one room with a large screen and then start to notice things. For example, a kitchen display area has steam coming from the sink at the same time as it happened on-screen. Then the film stopped and we had to move through to a forest area and then the final room with a large Christmas dining table. 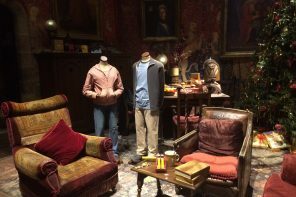 An oversized special guest came in to say hello and then you exit through the gift shop. I’d recommend taking the little ones to Santa Land next for age-suitable rides, plus the free Santa’s Grotto. The Magical Ice Kingdom has a ‘Secret Forest’ theme for this season with woodland animals and mythical creatures created from more than 500 tonnes of ice and snow. At -10C, it’s obviously cold inside but with your coat, hat and gloves on you’ll cope. There’s a small ice slide inside too (although there’s a 45m long Ice Slide in Santa Land this year so that might be more exciting). I’ll admit I rushed around this attraction and was out the other side in under 10 minutes so it’s up to you if you consider that good value for money. There are some photo opportunities (pretend your a centaur, etc) and there’s an app to make it look like’s snowing but I didn’t see anything about that until the next day when I was back home. 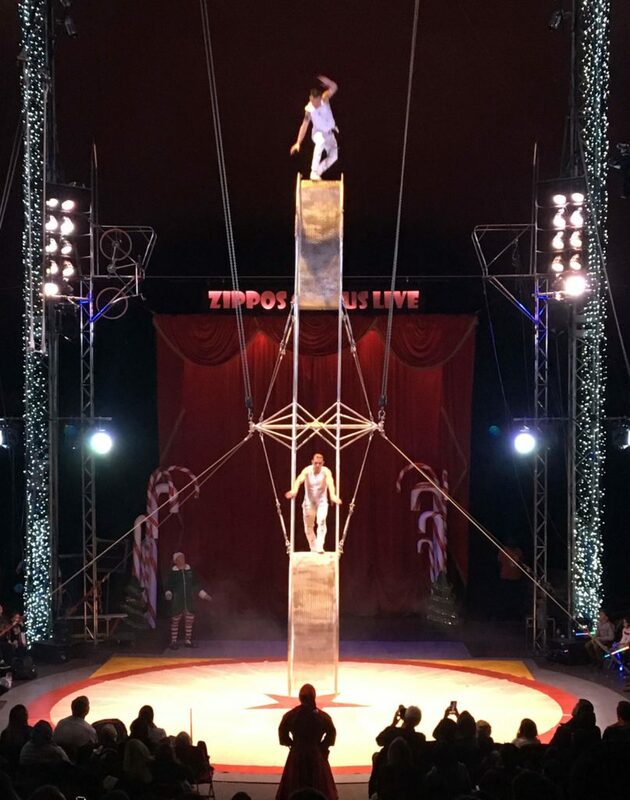 Zippos Christmas Circus is back with a new fun festive show in the MegaDome. Expect jaw-dropping skills, comedy, acrobats and aerial acts plus the family favourite larger-than-life dancing Snow Bears (that were on Britain’s Got Talent). This year, the international cast is joined by Paulo Dos Santos; at just 3ft tall he’s talent is huge so he’ll wow audiences with his acrobatics, dancing and comic skills. The MegaDome is heated and the 50-minute show is on multiple times a day. I really enjoyed this show. It’s festive and a real family show. Paulo dos Santos is great as the Spirit of Christmas and Mr Fips is s funny elf. There’s some amazing talent such as the skipping act where there were human towers skipping! And the Wheel of Death (see below) with two men spinning around inside and outside the wheels. In all my years going to Hyde Park Winter Wonderland, I’d never seen an ice show so I made a special effort to see Peter Pan On Ice. Audiences of all ages are invited to take a journey to Neverland as the childhood hero returns to his spiritual home at The Royal Parks. Performed by the internationally acclaimed Imperial Ice Stars, J M Barrie’s well-loved story takes to the ice with spectacular flying, swashbuckling aerial sword-fighting and stunning special effects. 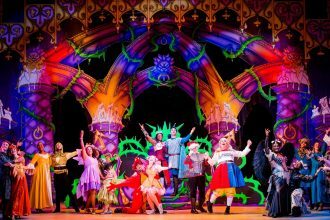 There’s animated scenery, fire-on-ice and original music and songs within the 50-minute show. I really liked the show and the 12yo sat mesmerised. It’s not a huge ice rink/stage but the skaters are excellent performers. And when they flew over our heads the whole audience turned around to watch. Santa Land has got even bigger this year as a 45m-long, real Ice Slide has been added so it’s not just for the little kids it seems. Thrill-seekers can grab an ‘Ice Tube’ and experience skimming down an ice-covered ‘mountain’ side. This unique winter experience is available to all ages, although younger visitors must be accompanied by an adult. It’s essentially, big inflatable rings that you sit in while sliding down an ice slope. I sent down a 6 year old and 12 year old and they both loved it! And while this age group won’t want to go on the huge rollercoasters, they will love the fun houses. I do too! The Alpen House is my favourite and we squeal on that one every year. The UK’s biggest outdoor Ice Rink is back and this year it’s even bigger. Located within beautifully leafy surroundings, skaters glide around the Victorian bandstand where there’s often live music performed. The ice skating sessions take place on the hour, every hour and last approximately 50 minutes. Winter Wonderland Coaster Passes are available so you get tap ‘n’ ride access onto all of the epic roller coasters. A minimum payment of £30 is required (with a £5 initial purchase bonus) and can be topped up from the box offices on site, or online. Coaster Passes can be used throughout the season so you don’t have to go crazy on one day. The evening circus is a high-octane show featuring mind-blowing stunts. 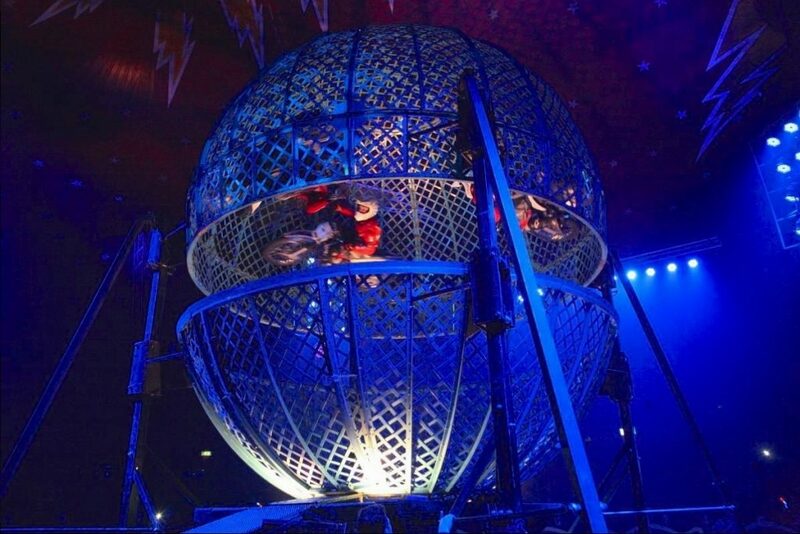 Cirque Berserk has an all-new show combining the most incredible daredevil acts from around the world including the return of the incredible Globe of Death, where multiple motorcyclists speed at over 60mph inside an unbelievably small steel cage! The adrenaline-pumping entertainment should keep you warm but you’ll be in the heated MegaDome so nice and toasty. If it’s over 18s you could treat yourself with a private Champagne Box upgrade. I absolutely loved this show! The female aerial artists were my favourite act and the 12yo was wowed by the illusionist (we have absolutely no idea how he did those tricks!) You can see some video snippets on my Facebook post. Stick with the heated MegaDome, as there’s another first for Winter Wonderland with a new 9pm nightly Comedy Club. The fast-paced 45-minute sessions have established and up-and-coming stand-up comedians including Terry Alderton and Dane Baptiste. This is for 16 years and over and there’s a bar available throughout the show. Oh yeah, and tickets are from only £10. I’ll admit I’m very tempted by this addition. Inspired by the sculptures in The Magical Ice Kingdom, new for this year are the Ice Sculpting Workshops. 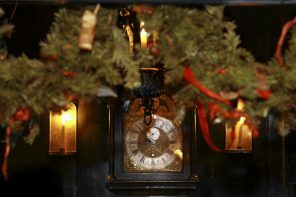 Christmas crafters can try their hand at creating their very own masterpiece in a bespoke sculpting studio. Under the expert guidance and instruction of the UK’s finest ice artists, guests are given training on how to bring to life their beautiful ice creations. Sessions last for 30 minutes and are available from Wednesday to Sunday. And let’s not forget the Giant Observation Wheel. Suitable for all ages but probably more appreciated by the older audience who like seeing the views. I’ll admit, I’ve never tried this as the I find Hyde Park Winter Wonderland more of a ‘rush around/bright lights/lots of noise’ kind of place so have never had the patience to wait in line to try this. 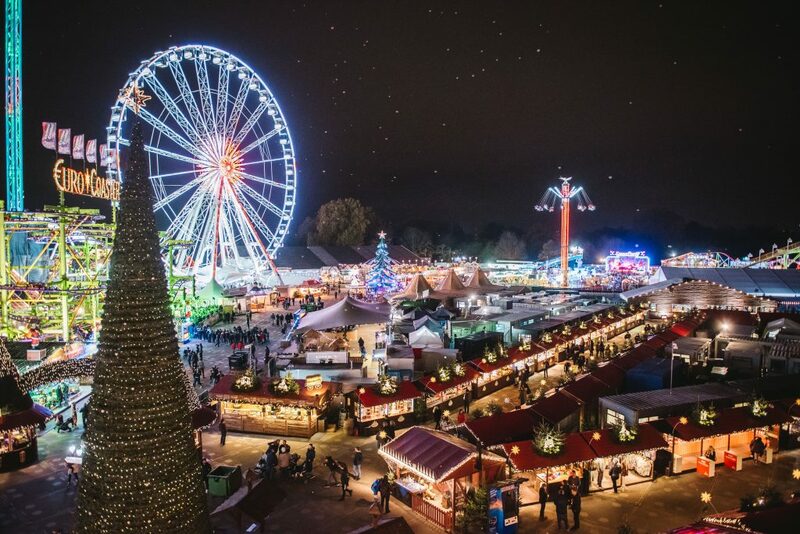 To confirm, entry to Hyde Park Winter Wonderland is completely free. 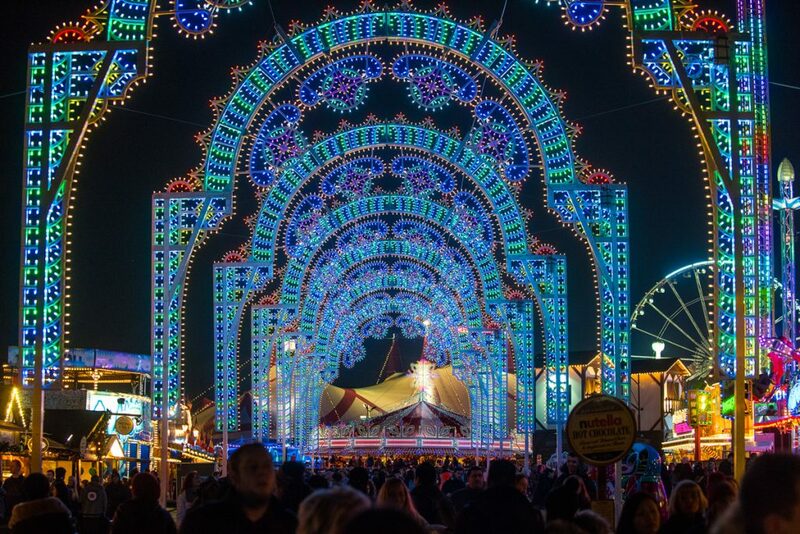 So you can visit to eat some churros and sing along to festive tunes without needing tickets for rides. 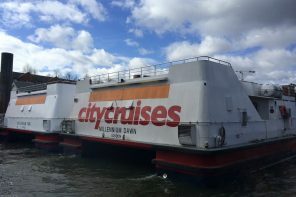 But, when it gets busy, ticket holders get in first so advance booking for attractions is always recommended. Individual attraction prices start from £7 adult / £5 Child / £20 Family* / £6 Concession plus booking fee. (Off Peak prices also available). Food Prices: A note regarding food. I visited on a Wednesday evening and Sunday daytime and the food prices were hiked up dramatically on the weekend. A box of chicken noodles was £6 on the Wednesday and £8 on the Sunday so be aware. Ride Tokens: And a note regarding the cost of rides. Even at the huts selling ride tokens there are no prices displayed. I tried waiting in line to ask about the cost but simply wasted time as it took too long so I never reached the front of the line. I’ve noticed lots of people asking about the price of ride tokens on social media yet the official channels never reply. The crazier the ride, the more tokens you need but HPWW do not make it clear in advance. I think a roller coaster was £9 last year so that should help you budget for a visit.